There are many bench grinders available in the market. Though all the bench grinders will get the basic job done, you need to select a bench grinder based on the task you will be using it for. For example, if you are looking to use a bench grinder to deburr ragged and chipped edges as well as remove rust from metal, you will want to opt for a bench grinder that features a wheel with lower grit, for coarse grinding, if you are looking to shape, smoothen and sharpen, buff and polish tools, with a bench grinder, you will want to select a model that features a wheel with higher grit, so you get excellent results. If you want your tools to have a razor sharp edge, you will need a honing wheel, which delivers flawless results. Before purchasing a bench grinder, be sure to decide what task you will be using it for the most and then let the requirement of the task guide the choice. The price of bench grinders is likely to be based on the features they offer, the strength and quality of the motor, in-built safety features etc. among other things. Mentioned below is a list of top three bench grinders (with their features) that are a great value for money. Five years shy of completing a century, DeWalt is a leader in woodworking equipment industry. Built in overload protection mechanism helps to maximize the life of the motor. This bench grinder can take on all grinding operations, such as tool sharpening, deburring protrusions or chipped edges, removing rust etc. DeWALT DW758’s design is ideal for grinding long tools as the design features a distance of twelve and a half inches between the wheels. This bench grinder features aluminum tool rests. The tool rests are adjustable and large enough to position the workpieces accurately. 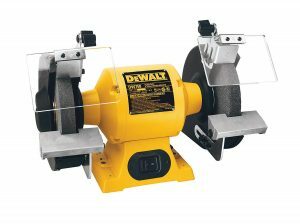 This bench grinder has a cast iron base making it long lasting and sturdy. This bench grinder offers great versatility. It features two 8 inch wheels. One is 36 grit for coarse grinding and the other is 60 grit for fine grinding. DeWALT DW758 features transparent eye shields. Tool rests are made of aluminum and tend to warp over time due to exposure to heat.Grinding tools on a warped tool rest hampers the finishing quality. With over 90 years of experience, Craftsman has outdone many of its competitors in the hand and power tools industry. 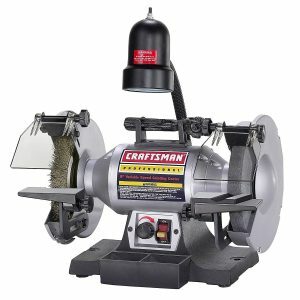 Craftsman Professional bench grinder is a variable speed machine. It can take on a variety of grinding tasks such as sharpening tools. It is also ideal for deburring as well as rust removal, cleaning, buffing and polishing surfaces. Craftsman Professional bench grinder features an incandescent light that illuminates your work space for greater accuracy. The work light has an independent power on / off switch. The unit comes with a wheel dresser (handheld) for cleaning and truing the abrasive wheels. Safety while working is paramount. Which is why this bench grinder features a set of transparent eye shields. Tool rests on this bench grinder are adjustable and include patented attachments. Water tray on Craftsman Professional bench grinder allows for quick cooling of tools immediately after grinding. Base of this bench grinder is made of cast iron. It helps a great deal in reducing the vibration when grinding work is underway. The wheels do not come to a halt immediately upon power off. The bench grinder winds down. It takes anywhere between 30 to 60 seconds to wind down based on the speed you were using it at. This can considerably impact the end result. Since decades, Skil has been leading development and innovation of hand tools and power tools for woodworking. 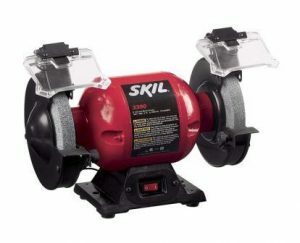 SKIL 3380 powered by 2.1 Amp motor and turns the wheels at 3450 revolutions per minute (RPM). Rubber feet on the bench grinder help prevent movement and increase stability during grinding. Adjustable tool rests allow accuracy in grinding. LED lights are built-in, over each wheel of the bench grinder. SKIL 3380 features transparent eye shields. This unit features two wheels. One for coarse grinding and one for medium grinding. Users feel that an additional wheel with high grit should be included for fine grinding. In order to work with an industrial grade machine, you need to ensure the work place is adequately illuminated. Some models of bench grinders feature an in built light, so that you can achieve accurate results.If you are working with tools that are used for woodworking or woodturning, the finish needs to sharp and accurate. For tasks such as these, you are likely to need additional installations such as an angle guide, jig etc. Some models include these additional accessories with the unit, but most don’t. Regardless of the level of experience and expertise, you must always exercise caution. Avoid wearing loose clothing, as there is a possibility that it might get caught in the machine / tools while grinding. Avoid wearing any kind of jewelry on your hands (finger rings or bracelets) as your hands are likely to get exposure to heat. Wear industrial gloves made of latex or rubber as they not only keep your hands safe from injuries and burns, but also provide a good grip on the tools.Grinding causes intense friction, which generates sparks. You might want to keep in mind to look for models that have adjustable eye shields. In case the model meets other criteria, and does not have eye shields, you may want to consider investing in welding safety goggles or a transparent flip helmet to protect your eyes.